Home / CELEBRITY NEWS / Kristen Stewart is back as a Feisty Small-Town Girl in "American Ultra"
Kristen Stewart is back as a Feisty Small-Town Girl in "American Ultra"
Stewart and Eisenberg had instant chemistry, Nourizadeh says. "They hadn't seen each other in a couple of years, but the connection was instantaneous. When we started shooting, they were completely comfortable together even in the most intimate moments. We needed that for the comedy to work. They're definitely two people I would love to work with again." After meeting with the pair together, the filmmakers were sure they would be convincing and appealing as a couple dedicated to getting baked together. 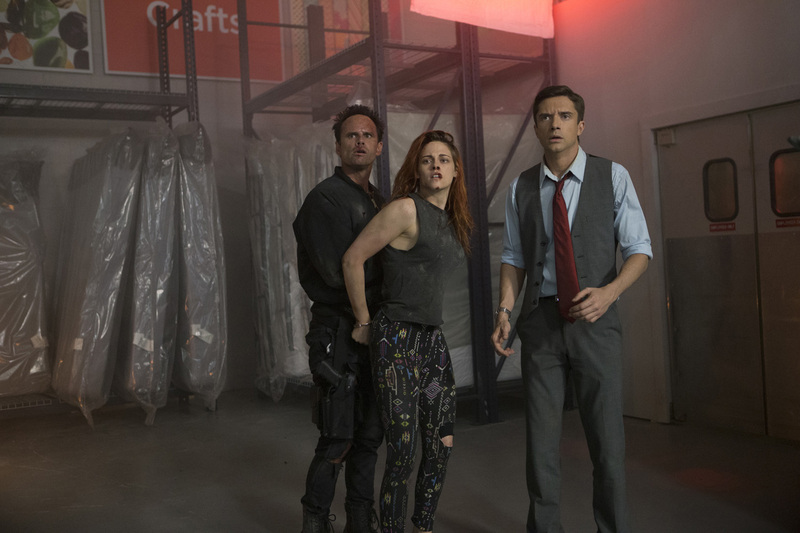 "There's something about Jesse and Kristen that is so compelling and so right," says producer David Alpert. "The idea of re-teaming them was a dream come true. She's very alluring and charismatic on screen, and she brings amazing depth to the character and the relationship. It's not just a supporting girlfriend role: she's an equal." Like Eisenberg, the actress is taking a role that is not typical for her, notes screenwriter Max Landis. "She's not the sacrificial dove or the princess who must become a warrior," he says. "Kristen's played all sorts of crazy characters, but in this she plays someone closer to who she really is, a sort of laid-back tomboy." Stewart admits she jumped at the chance to work with Eisenberg again. "We should make a movie together every five years," she says. "It's just so comfortable to work with him. He's hilarious and intimidatingly intelligent. And this script is so original. Imagine that your stoner buddy just turned into an expert CIA assassin and the chaos that ensues. It's an ultra-violent, in-your-face action movie, as well as an emotionally grounded love story, as well as a full-on slapstick comedy. I wanted to explore that with Jesse." Watching Mike conquer the CIA's most vicious operatives is an unexpected delight, she promises. "These two kids turn into something you would never foresee. Watching us annihilate a town or take out deadly killers is just funny, especially with Mike's off-the-wall commentary as it goes down. I haven't had this much fun making a movie in years." For that, she gives full credit to Nourizadeh. "He is incredibly detail oriented," says Stewart. "He left no stone unturned. He's such a sensitive dude that he was truly concerned with everything, including the little sweet bits, like the matching tattoos on our feet."